This article demonstrates how to execute SQL DELETE query from Python application to delete data from the MySQL database. After reading this article, you can delete a single row, multiple rows, all rows, single column, and multiple columns from MySQL table using Python. MySQL database table name from which you want to delete data. To perform a delete operation, I am using “mobile” table present in my MySQL server. 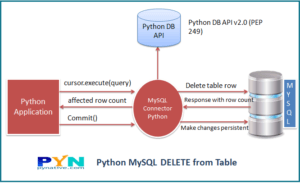 Note: We are using MySQL Connector Python module to delete rows from MySQL table. Establish a MySQL database connection in Python. Prepare the Delete statement query (To delete columns or rows you must know the table’s column details). Execute the DELETE query using cursor.execute() to get numbers of rows affected. Close the cursor object and database connection. Let see the example now. In this example, we are deleting a single row from the “mobile” table. sql_select_query = """select * from mobile"""
sql_Delete_query = """Delete from mobile where id = 3"""
import mysql.connector this line imports MySQL Connector Python module in your program so you can use this modules API to connect MySQL. Then we prepared SQL DELETE query to delete a single row from “mobile” table. Delete query contains the row to be deleted based on a condition placed in where clause of a query. Next, We used a connection.cursor function to get cursor object from the connection. Using cursor.execute() method we can execute SQL queries. After a successful Delete operation, execute() method return us the number of rows affected. In this case, we got 1 because we are deleting one row. Once the record deleted successfully, we need to commit our changes to the database using a connection.commit(). In the end, close MySQL Cursor object using a cursor.close() function and MySQL database connection using a connection.close method. ICheck out our Python Database Programming Exercise master the database programming techniques in Python. Sometimes we need input from the user, for an example when the user is deleting their data from the web portal or any other details through User Interface. in such scenario we need to use a parameterized query i.e. prepared statement. It is always best practice to use a prepared statement, i.e. placeholders ( %s ) inside any SQL statements that contain input from users. Parameterized query helps us prevent SQL injection and other SQL issues. Refer to How to use a Select query to fetch data from MySQL table so you can verify your delete operation result. The cursor = connection.cursor(prepared=True) function allows a prepared statement to execute a query. We defined SQL delete query with placeholder which contains mobile ID to be deleted. And prepared record to be deleted in tuple format. Sometimes we need to delete an N-number of rows which match a specific condition. for example, You want to delete employee data from the employee table who left the organization. You can delete multiple rows from MySQL table using a single delete SQL Query in python. I have prepared an example which illustrates the same. The cursor = connection.cursor(prepared=True) function allows a prepared statement to execute. We defined SQL Delete query with placeholder which contains mobile IDs to delete. Also, prepared List of records to be deleted. This List contains tuple for each row. Here we created two tuples, so we are deleting two rows. We used cursor’s executemany() method to delete multiple rows of a database table. Using a cursor.rowcount method we can find how many rows deleted successfully. It is possible to delete all rows using a Truncate SQL query. Truncate SQL query help to removes all data from a table, typically bypassing the number of integrity enforcing mechanisms. you can refer Wikipedia article to read more on SQL truncate. Let’s move to python code to delete all rows from MySQL table. Delete_all_query = """truncate table mobile """
sql_Delete_query = """ALTER TABLE mobile DROP COLUMN price"""
You can delete old and unused tables from the database using a DROP TABLE statement. Let see the demo. sql_Delete_query = """DROP TABLE mobile"""
You can delete an old unused database from the MySQL using a DROP DATABASE statement. Let see the demo. sql_Delete_query = """DROP databse pynative"""